Mike Frisch took this bass on a Rock-it Jig/plastic combo. The plastic got knocked during the fight, which isn’t uncommon after the bait has caught a few fish. Summer has arrived pretty much everywhere in fishing country. The spawn is over, so the fish, regardless of specie, are doing one thing: They’re either eating, or they’re looking for something to eat. If you can put a bait in front of a fish in a way that looks appealing to the fish, they’ll probably eat it. An outstanding way to present a bait to a fish right now is a plastic bait of some sort. Plastics come in all shapes, sizes, and colors, and they will all catch fish. 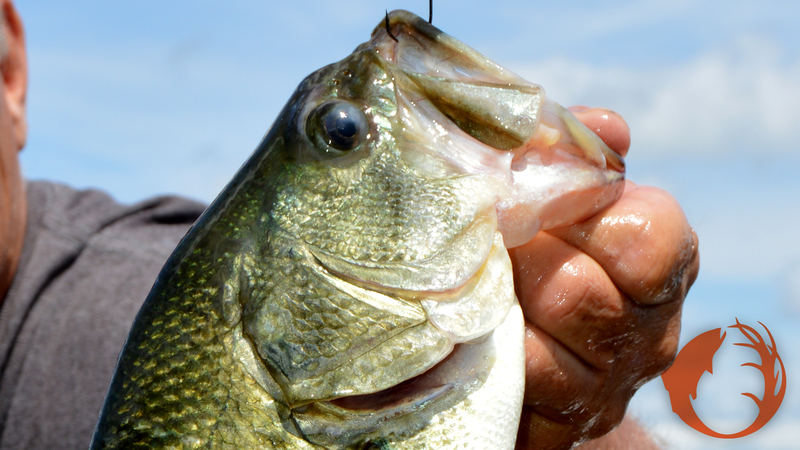 Here are some ideas for catching fish on plastic baits now and for the next couple of months. A plastic bait rigged on a jig-head will be very productive much of the time. Some jigs are made for plastic baits. The best jigs for plastic have long-shanked hooks and keepers that prevent the plastic from sliding down the hook. The Rock-It Jig is an outstanding example of a jig made for plastic baits. Most of the time it works best to just thread the plastic on the jig. Put the point of the hook into the nose of the plastic and thread it onto the jig. Some anglers are rigging plastics like the Impulse Dip-Stick through the middle, it’s called Wacky Rigging, and I’ve seen that work very well also. Fish can be color selective at times, so try a jig-head of one color with a plastic of another color. Experiment with different color combinations until you hit on the right one. Watermelon is a good color in many situations. In many bodies of water the weedline is the center of activity for fish, so that’s a good place to throw your bait. All sorts of fish species travel along the weedline, and a jig and plastic will appeal to them all. Go smaller if panfish are the quarry, larger for walleyes and bass and pike. An eighth ounce jig will be good most of the time. Fish it on eight or ten pound test line. P-Line CXX is really tough stuff, and that’s important when fishing the weedline. Vegetation can be hard on line, so use line that is abrasion-resistant. All we’re doing is finding the deep weedline. On clear lakes it will be deeper than in lakes with stained water. The deep weedline often sets up in seven to fifteen feet of water depending on the lake. Position your boat a short cast from the weedline and start throwing. You’ll usually find the fish in pockets and points in the weedline. Watch your line closely as the bait sinks. Fish will often hit on the fall. If the line does anything out of the ordinary, set the hook. We use the side-imaging feature on our Raymarine sonar to locate the weedline without actually having to go over it. These units make it so much easier to stay at the proper casting distance from the weedline. Try a variety of bait shapes. A classic go-to plastic is something like an Impulse Ringworm, but Paddle Minnows and Smelt Minnows will also be good, especially if walleyes are the quarry. Plastic baits stay on the hook well: They’re not always ripping off as you pull them through the weeds like live bait does. Live bait is a great option when the bite gets really tough, but plastic is a very good place to start this time of the year when you’re just looking for some fish to catch, and I guess when I go fishing, that’s what I’m doing: Just looking for some fish to catch.